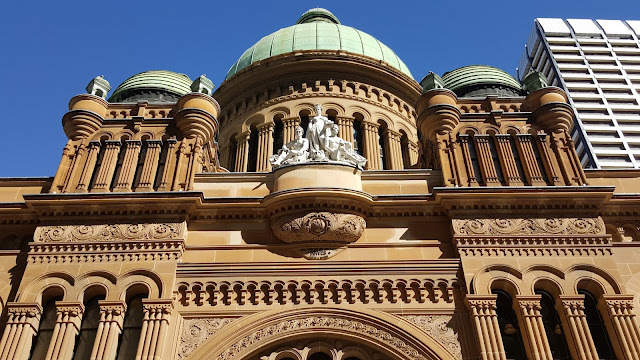 These domes and sculptures stand above the George Street entrance of the Queen Victoria Building, which houses retail shops, cafés, and restaurants. The Queen Victoria Building was designed by George McRae and completed in 1898 in the Romanesque architectural style and restored in 1986. The sign reads: This stone was set July 29, 1896 by I.E.Ives, Mayor of Sydney. The sculptures, created by William Priestly MacIntosh and installed in 1899, are: a female figure representing Wisdom and Justice, a male figure representing Labour and Industry and another male figure representing Commerce and Exchange. It is a wonderful building and thanks for the information about the sculptures.